Bring the kids along to Karijini National Park and Dales Gorge. The adventure continues: explore the stunning scenery at Hancock Gorge, take in the dramatic natural features at Joffre Gorge, get great views at Oxer Lookout, and hike along Weano Gorge (Handrail Pool). To find ratings, where to stay, traveler tips, and tourist information, read Karijini National Park road trip app . Perth to Karijini National Park is an approximately 16-hour car ride. 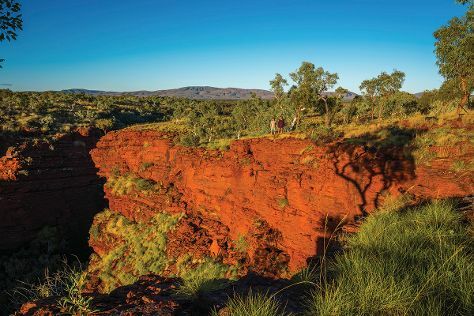 While traveling from Perth, expect somewhat warmer days and about the same nights in Karijini National Park, ranging from highs of 27°C to lows of 11°C. Wrap up your sightseeing on the 10th (Wed) early enough to travel to Coral Bay. Coral Bay is a small town on the coast of Western Australia, north of Perth. You'll visit kid-friendly attractions like Dolphin & Whale Watching and The Coral Bay Shark Nursery. And it doesn't end there: kick back and relax at Coral Bay Beach, look for all kinds of wild species at Ningaloo Marine Park, and head outdoors with Aqua Rush. Use Inspirock's suggestions to plan your Coral Bay trip and find the best activities and attractions for your vacation. Drive from Karijini National Park to Coral Bay in 7 hours. You will leave for home on the 15th (Mon).